Today I begin a new occasional feature that will highlight a single Victorian "thing" outstanding for its beauty, utility, or both. 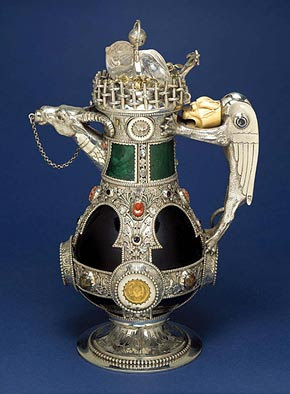 First up: the Fitzwilliam Museum at Cambridge University introduces us to a remarkable wine decanter made in 1865 by the even more remarkable William Burges (1827-1881). What does this man, who was "steeped in hallucinatory laudanum," have in common with guitar legend Jimmy Page (er ... besides a fondness for mind-altering substances)? Read on. 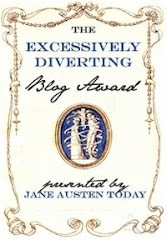 "This flamboyant and strange-looking object comes from the imagination of a flamboyant and strange-looking individual. A parrot-keeping, rat-hunting, opium-eating Freemason, Burges was an archaeologist and architect who was so short sighted, it is said, that he once mistook a peacock for a man. He was a great traveller, fascinated in particular by the art and culture of thirteenth-century Europe, and he became a leading figure in the nineteenth-century Gothic revival that dominated English taste between c.1830 and 1880. 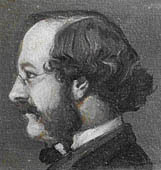 "Though William Burges - 'Billy' or 'ugly Burges' to his many friends - is comparatively little known today, affectionate accounts of him by his contemporaries abound, and monuments to his peculiar Victorian Gothic genius still stand: Cardiff Castle and Castell Coch in Wales, St. Fin Barre's Cathedral in Cork, Ireland. "Of his surviving buildings one of the most intriguing is Tower House in Melbury Road, West London, a home that he began designing for himself in 1875. [Note: This house is currently owned by former Led Zeppelin guitarist Jimmy Page, who bought it from the actor Richard Harris; read this fascinating BBC story for additional information. -- KT]. "As the house neared completion in 1878, Burges (right) started to move his furniture and effects in. The interior became a dazzling testament to his antiquarian enthusiasms, his broad learning, and his eccentric imagination. Cultures and colours are mixed to startling, often humourous effect. The porch floor is dominated by a Roman style mosaic of his favourite dog Pinkie. Above the fireplace in his library, a sculptural frieze shows Queen Grammar issuing orders to the allegorical figures of Pronoun, Verb, Article, Noun, Adjective, Adverb, Conjunction, and Preposition. In the guest bedroom all is gold and crystal and four emu eggs hang from the butterfly-festooned ceiling. On the beams are represented scenes of the mock-epic battle between the frogs and the mice. "This wine decanter would have blended in perfectly in such florid surroundings. An inscription around the neck tells us that Burges had it made for himself in 1865, and that it was paid for from the proceeds of his prize-winning design for the Crimean Church in Constantinople, a design that was eventually considered too costly to build. Maker's marks reveal that the decanter was constructed for the designer by Josiah Mendelson and George Angell. These two were effectively employed to put together an elaborate three-dimensional jigsaw, for the dark green glass body of the vessel is adorned with a remarkable array of objects from different cultures and periods. 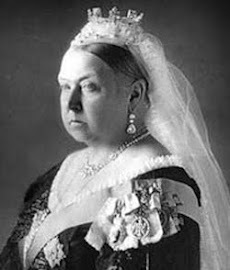 It is in many ways typical of the eclecticism of Victorian taste. "The ivory, leonine head of the griffin that makes up the handle (right) is based upon the pommel of an eighth-century Assyrian dagger in Burges' own collection. 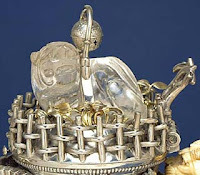 "An eighteenth-century Chinese rock crystal lion rests on top of the decanter's lid (left). "The green glass body and malachite neck are clad in silver, which is itself studded with Greek, Roman, and Byzantine coins; Roman and ancient Persian intaglios (carved gems); and coral cameos (right). 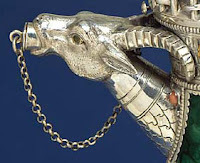 "The spout is made of silver and takes the form of a ram's head, the horns curling back to the neck of the vessel (left). "Silver foliage and animals are applied to the silver casing. On the foot of the decanter, like the fauna found in the margins of a medieval manuscript, we find engraved a hedgehog, a mouse, and a wren with a worm in its mouth accompanied by the inscription I WREN, for Jenny Wren. "Two more decanters closely resembling this one were made to designs by Burges, one of which is now in the Cecil Higgins Art Gallery in Bedford, the other in the Victoria and Albert Museum. An article that appeared in The Builder six years after Burges' death described these works as 'the best pieces of modern grotesque to be seen.'"